Toasted Wholegrain Oat and Honey Clusters with Flaked and Whole Almonds, Sliced Brazil Nuts and Roasted Chopped Hazelnuts. With almonds, brazil nuts and hazelnuts. 100% natural ingredients. Lowers cholesterol. High in fibre. No added salt - salt content is due to naturally occurring sodium. Non GM. Suitable for vegetarians.It's super for a reason We take the best quality ingredients and don't mess about with them. Wholegrain British oats, blended with a hint of honey and baked to a crunch, packed with almonds, Brazil nuts and hazelnuts. All of that, and helps lower cholesterol* too. We said it was super. *The inclusion of oat beta-glucan as part of a balanced diet and a healthy lifestyle can help reduce cholesterol levels. 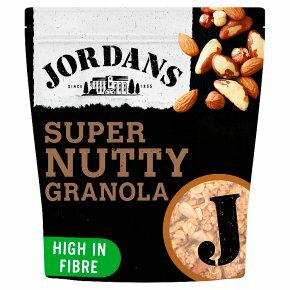 Each 45g serving provides 1g of beta-glucan soluble fibre, one third of the suggested daily intake of 3g. High cholesterol is a risk factor in the development of coronary heart disease. Coronary heart disease has multiple risk factors and altering one of these risk factors may or may not have a beneficial effect.